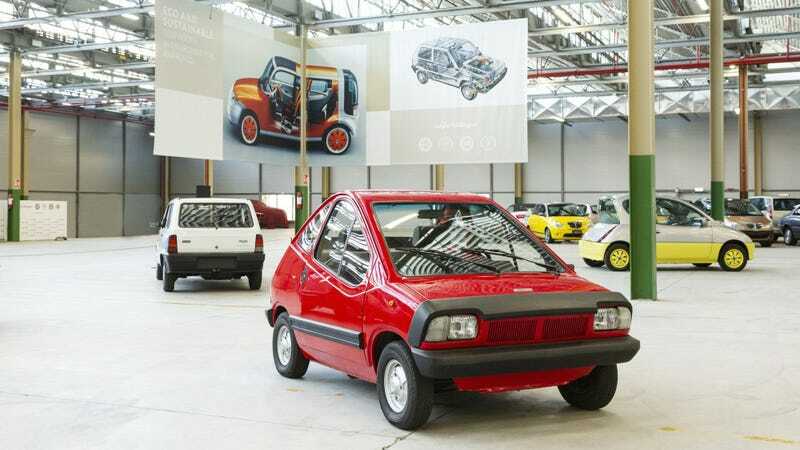 The people at Fiat Chrysler Automobiles finally got their act together and decided to show off its huge collection of Italian classics, bringing together row after row of Fiats, Abarths and Lancias under one big roof the company has dubbed its Heritage HUB. There are so many cars I wouldn’t know where to begin. Spread across 15,000 square meters, or just over 161,000 square feet, are 250 classic Italian cars, 64 of which are split into eight specific categories covering varying design concepts, roughly translated, including small and safe design, style milestones, epic journeys, sustainability, architectural stars, concept cars and one-offs, and record-setters. Some of the cars will also be occasionally swapped out between the company collection of over 600 models. The facility itself dates back to the 1960s when it was used to manufacture transmissions, and has been carefully restored to its original conditions to reflect the restorative nature of the collection of cars it’s now home to. In the same building is FCA’s customer restoration program. Some of the cars in the display collection include the Lancia Augusta, Ardea, Aurelia B20, Flavia, and the Fiat Barchetta, S61, 130 Familiare, Barchetta, Panda Rock Moretti, Uno, 500, and 600, and obviously a lot more. Some of the photos indicate there are also some Alfa Romeos scattered around, but it doesn’t seem like that brand is as highlighted as the three others. There’s also some star cars, including the Lancia Fulvia HF 1600, winner of the 1972 Monte Carlo Rally, the Stratos HF, the Fiat 124 Abarth Rally and 131 Abarth Rally. I couldn’t find a comprehensive list of everything on the floor, so you’ll just have to squint at the photos and do your best, or go check out the collection for yourself in Turin when it eventually opens to the public at some point yet to be announced.